CREATE AN ACCOUNT to register for any event posted by the Milwaukee County Public Links Association! Already created an account? You can LOGIN. Keep your PROFILE up to date with your email address, home club and membership status! Register and pay for EVENTS online! Payments are easy as you can pay from the conveinence of your home or mobile phone! You will be emailed a receipt and a confirmation for your event registration. Check back here as the tournament date approaches. Tee-times, results and the winners picture for each flight will be posted on each tournament page! 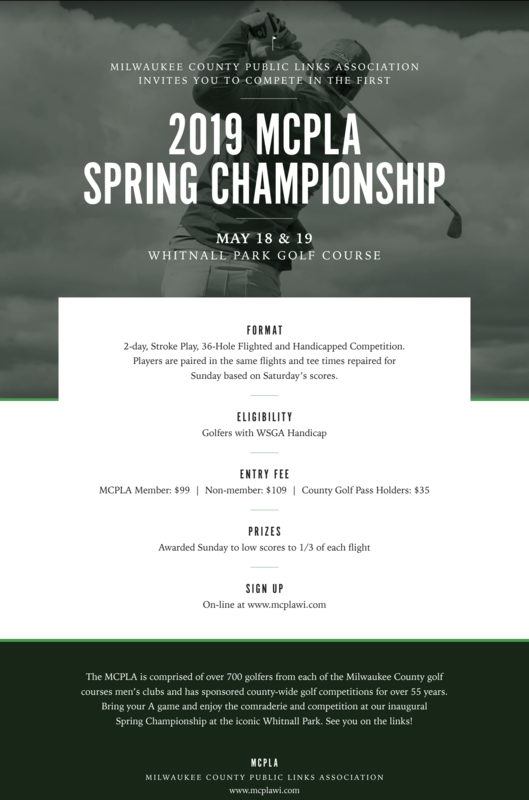 Utilize the PLAYERS PAGE to find and connect with fellow MCPLA golfers. Keep up to date with the MCPLAWI! We will periodically post MEETING MINUTES as well as new NEWS AND UPDATES to help keep you informed!